We had one for twins. Very loud annoying beep and it lasted 11 months and the element blew. 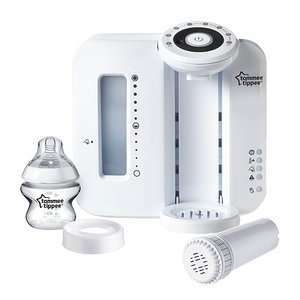 Tommee Tippee customer service was attrocious giving us the runaround for weeks saying send a video, then replying we can't go on youtube, the we can't receive your emailed video as it is too large, send us a photo of it from every angle with a sign next to it. Send photos with the plug cut off all with a week gap between each stage. Eventually, they said they would send a new one but it would be in sky blue! In the end, emailed Amazon and they gave us a full refund and a returns label. Now this feels like a great idea. Thanks! Such a good gadget to have - got ours for £60 last year and just purchased another for brother’s new addition. The machine doing its thing isn't too loud from the next room but there is a very annoying beep which confirms the different stages that we could hear all over the house (and spooked our dog). There's a couple of YouTube vids out there on how to stop it. 5 Minute job to take the back off, identify the wire and a quick snip later, no beeps! Agreed. Although i wouldn't spend this amount on it personally considering its literally a britta filter machine with a ketle element. We got ours 2nd hand in good condition (We knew the person selling and they always used filters and cleaned it etc.) for a tenner...the used market is great for these but obviously some people wont be comfortable with this. Easy to clean with a milton tablet in some water running through the clean cycle. Not overly. When you press "on" it beeps and makes a kettle type sound for a few seconds as it adds hot water, then beeps to say its ready for powder. Then you press the button again, it fills cold and then beeps twice at the end. Beeping is akin to a microwave finishing and the general noise of the pump is like hearing a dishwasher in another room for ~30seconds. Had a look at the nighttime ones which are quieter and tbh its not worth the extra cash. If your baby doesn't wake up when you are talking downstairs, it won't wake up when its being used! 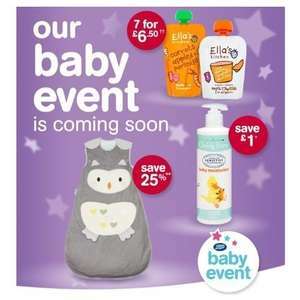 The £2 off applies on Jumbo Packs to all shops where you can buy Pampers. Not all kids are the same. Some are used with some brands and when change to other branda, the little one has a rush reaction. Good price for Pampers but I actually prefer the Mamia ones from Aldi. And they're only £4.39 for packs of 78. Boots Clearance Nappies reduced to £2 for 54. Usually retails at £8 .Store colleague advised due to change in package size which is now 52. What sizes were available? Is it size 1 only like your picture? Nappie pants £1.38, the pure where £3.20. Tbh tho sooner buy stores own brand and get about 50 for that price. I have voted hot. IF people see the post and find the nappy pants for £1.38 they will love you. Never miss a 'Pampers' deal again! Depends on which one. 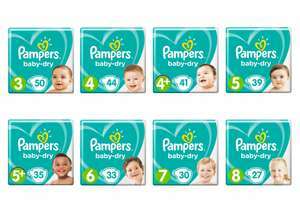 Pampers sensitive are 12x56 but pampers new sensitive are 12x50. These are in between. Nope. 672 vs 640 now. Same overall quantity (less packs, more in each pack). Good price for Pampers. Available in various sizes, several packs must be ordered, free delivery. I took a packet off the shelf to take a photo of it so yes it looks empty but it’s not. Asda North Cardiff, Giga packs of size 4 pampers (120 pack) scanning at £7. I wasnt comparing own brands, I purchased a box of Pampers wipes for 5 pounds last week. Not trying to ruin your deal I'm just helping people with more information. If you shop around at any point in time one of the big supermarkets has a very good offer on premium brand wipes. I've been buying them for years now so I'm well schooled on the issue. Cant compare Asda own brand to this one. Maybe comparing it with Boots own brand would be more appropriate. It actually comes to £6.30 if you are an advantage card holder. You get 10 points for each pound spent and each point is worth a penny. And this is even before stacking other offers they have running like £5 off £45. Asda have them for £5 But sold out in my local. New desine ones are in box of 8 for £10. Will stock up while can for cheap. Found wilko selling them now. Still great price. My wife is due August. Should I just buy 5 packs of size 2 which should at least get me started? A big palette of the Johnsons wipes in the Asda Living in Chesterfield this afternoon. Loads of boxes of pampers &amp; Johnson baby wipes in Asda Roehampton A3 this morning. I work the baby aisle a lot in Sainsbury's and we are getting these new XXL packs delivered so I think these are reduced because they are replacing them with bigger packs. Found in ASDA Manor Top Sheffield. Only size 4. Four packs left. Still 9.95 in Asda's rawtenstall today. If it wasn’t for the development of the Pampers modern disposable nappy, babies and toddlers would still be crawling and playing in reusable cloth nappies – as any parent or guardian who’s out and about will agree, these are not something you want to carry home after a mess happens. The relief of having a Pampers on hand means babies don’t have to feel uncomfortable and suffer from skin irritations due to a messy nappy. When you're trying to decide which nappies are right for your baby, it’s obvious that you’ll have to think about things like your baby’s age, weight, and any skin allergies. But you also need to consider things like different brands, costs, and convenience. Big brands like Pampers and Huggies offer a range of nappies to suit the needs of different ages and are always making them better in terms of skin sensitivity, absorbency, and flexibility. This complete buyer's guide to Pampers will explain everything you could ever want to know about this iconic brand of nappies. Starting with the history and development of the modern disposable nappy, this article will get to the bottom of different versions of Pampers nappies to suit your child’s stage of development, any special features to look out for, a side-by-side look at Pampers versus other well-known brands. There will also be comparisons between Pampers disposable nappies versus reusable cloth nappies, and the general pros and cons of Pampers. We will also answer some pressing questions you may have about nappies, such as whether they expire or not, how to prevent and treat nappy rash and where you can buy discount Pampers online. Although nappies have been used for centuries, they were originally called diapers, as this was the word for their geometric shape and white cotton fabric. Later, people in Britain started calling them nappies – this term continues to be used in the UK and in some other countries colonised by the British after the word “nappy” was adopted. People in countries colonised before the word was changed still use the term “diaper”, which is why you’ll still hear them being called diapers in the USA and Canada. Babies wore a cloth nappy up until the disposable nappy was invented. It was made up of a soft fabric on the outside, usually with the same terry towelling material you’ll find on a bath towel and robe. The inside had a softer and even more absorbent lining made from quality muslin. Because cloth nappies had fabric on the inside and outside, they were prone to leaking. That’s when people started to put rubber pants over the nappy, but discontinued this practice after concerns about poor air circulation and skin damage. Yet doctors couldn’t prove the rubber pants were a cause for skin irritations, because babies could also develop these problems if their nappies weren’t changed often enough. Disposable nappies started popping up in the first half of the 20th century, but the paper tissue interior was not kind to a baby’s sensitive skin and wouldn’t stay in place when the inside became sweaty or wet. Many inventive women continued to improve the design of the disposable nappy, knowing that mothers wanted a stress-free solution that would allow them to take their baby out with them without the worry of returning home with a dirty cloth nappy and then having to wash it. The most noteworthy improvement came in the 1950s, when an adjustable nappy made from waterproof plastic and a disposable cotton wool pad on the inside prompted major manufacturers like Johnson & Johnson, Playtex and Procter & Gamble to invest in the research and development of disposable nappies. The latter company then began mass marketing their invention and called it Pampers. With constant improvements to designs, Pampers have produced many different types of disposable nappy for different needs of each individual child, which will be explained in the next section. Gone are the bulky, tight fitting nappies that restricted a baby’s movements and in their place are the flexible, more absorbent designs we see today. The price has also dropped thanks to cost-effective manufacturing techniques and a high level of competition, making nappies more and more affordable as time goes on. 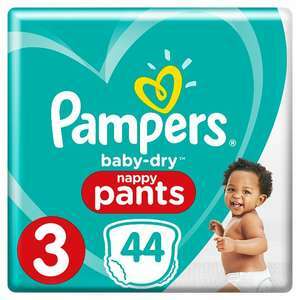 Pampers offer several different kinds of nappies, toilet training pants, and swim pants in eleven sizes, with sizes offered dependent on the design and features of the nappy. Pampers Premium Protection New Baby is a high-end product with lots of built-in comfort and protection features like a special Absorb-Away layer that draws wetness away from the baby’s skin to keep their bottom dry and a handy Wetness Indicator to let you know when it’s time for a nappy change. New Baby Sensitive has all the same features of the Premium Protection New Baby nappy, but with up to 50% more skincare ingredients to make them dermatologically kinder to babies with delicate skin. Pampers Baby Dry unisex nappies contain an Extra Sleep-Layer that makes them suitable for bedtime use. This additional layer of protection pulls wetness away from the skin and locks it away for up to 12 hours so that your child doesn’t get disturbed during the night with skin irritations or a wet bed. Pampers Baby Dry Pants provide identical dry protection as the nappy version except that their pull up and tear away design gives toddlers more freedom to walk around when they get up in the morning. Pampers Simply Dry nappies are an affordable option if you just want to keep your new bub fresh and dry without having to spend a lot on extra features like cute exterior designs and skincare ingredients. Pampers Active Fit (also known as Cruisers in the US) are a unisex nappy designed with a three-way fit around the waist, legs, and bottom to give active babies the freedom to explore the world around them. The Dry Max core lets your child play non-stop for up to 12 hours without feeling wet. Pampers Splashers Disposable Swim Pants mean you can play with your toddler in the pool or at the beach and not worry about a drenched nappy, thanks to their double-leg cuff leak protection, swell resistant material and super stretchy sides for a snug fit. Underjams pyjama pants for boys and girls are made with gentle yet super absorbent materials, and have fun printed designs on them to look and feel like regular underpants. They even come with a low-fitting waist to stop them showing above the waistline of pyjama bottoms, all designed to prevent any embarrassment at home or at a slumber party. How Do Pampers Compare to Huggies and Other Brands? Procter & Gamble’s main brand rivals in the nappy industry are Kimberly-Clark, the makers of Huggies. While Pampers holds the majority of market share, Huggies is a close second, with Japanese brand KAO making up the top three. Other nappy brands, mostly Asian, hold much lower market shares and smaller product lines. Both Pampers and Huggies produce a variety of nappies for babies from newborn to seven years old. Both also include features like a protective water absorption layer to hold water away from the skin and a wetness indicator for when the nappy is ready to be changed. The differences between the two come down to experience rather than quality. Many reviews and user tests show that it comes down to how they feel the nappies can absorb water and stay fastened in place, with many people demonstrating a preference for Pampers over Huggies. Are Pampers or Cloth Nappies Better? It’s not a case of whether disposable nappies are better or worse than cloth nappies; it’s really more about the convenience, cost, and how you feel about throwing away used nappies compared to washing soiled cloth nappies. The total cost of cloth nappies is basically the time, water, and washing detergent you spend washing them, whereas disposable nappies can be expensive, even for a massive bulk pack. As for convenience, there’s no doubt that it’s much easier to toss away a used nappy than it is to wash and wait for a cloth one to dry. An important thing you may want to consider in the choice between cloth nappies and Pampers is how each product is made. Some toxic chemicals like chlorine are used in the bleaching process of disposable nappies, while added dyes and fragrances may also emit toxic substances. What might help make your mind up between the two is that, for hygiene reasons, there are places where disposable nappies are the only acceptable option such as if you plan on using the services of a day care centre. Pampers Fresh Clean Wipes are made to maintain the skin’s natural pH levels. They have a balanced wetness and perfume scent to add a light freshness to your baby’s skin. Pampers Natural Clean Wipes are the fragrance-free version of Pampers Fresh Clean wipes that are perfect for babies that might have issues with certain scents added to other wipes. Pampers Sensitive Wipes are the 15% thicker version of Pampers Fresh Clean wipes. Both dermatologically tested and free of perfumes, Pampers Sensitive Wipes are made with natural ingredients like pure water and chamomile to keep skin naturally healthy. Kandoo Flushable Toilet Wipes are perfect for the toilet training stage of a child’s development. They teach young kids how to properly wipe their bottom with a hygienic, compact wipe they can flush themselves. They are made with a biodegradable material that’s good for nature and won’t harm the skin. Nappy rash is typically the result of a soiled nappy that hasn’t been changed for a while, too much moisture in the nappy that can’t escape or dry out, or the nappy rubbing and causing friction on the skin. Doctors haven’t found a direct link between a brand of nappy and the likelihood of a baby developing a rash, but if you find that one type tends to produce a rash more than others then you can switch to a different style of Pampers – perhaps one aimed at babies with sensitive skin. The best way to prevent nappy rash is to make sure you change your baby’s nappy frequently and clean the nappy area well with a fresh wipe. Of course, it’s not always easy to know when a baby needs changing, as checking every five minutes isn’t always convenient. That’s how features like a wetness indicator like the one on Pampers Premium Protection New Baby nappies come in handy. There is a difference between nappy rash and an allergy to nappies. So if your baby does get a rash or other skin marks from a particular brand of nappy then it could be because of an allergy. Typical substances in nappies that cause an allergic reaction include the dye used to colour the cute patterns on the outside, or a skincare product added to the nappy. Simply switch to one of Pampers’ nappies that doesn’t contain any added colour dyes or extra skincare ingredients. Absorbency – Improvements in the materials used in nappies mean they are ultra-absorbent. They can now attract water away from the skin and hold it in place until you get a chance to change the nappy. Fit – Thanks to their use of flexible materials, Pampers can make nappies with adjustable waists and legs to prevent leakage. Style – Different materials mean different types of nappies can be used at different times, such as for toilet training or bedtime use. Easy to dispose of – Simply throw away after use. Nothing could be easier. Expense vs. Cloth Nappies – The average baby will need around 4,000 nappies in their lifetime. This means buying 4,000 nappies for every baby you have. Cloth nappies, on the other hand, simply need to be washed and reused. Harmful to the environment – Although there isn’t a hot debate over their environmental impact, disposable nappies take a long time to biodegrade. And with 4,000 nappies per baby, this means mountains of nappies are sitting in a landfill for a long time, not to mention the amount of resources spent on their manufacture. You could argue that washing cloth nappies wastes a lot of water, but this is no longer the case when using modern, water-efficient washing machines. Pampers, like many other nappy manufacturers, don’t typically print a use-by date on their product packs. That doesn’t necessarily mean that nappies don’t expire. Nappies made with skincare ingredients are likely to expire after approximately two years, even if stored in a cool, dry, dark environment as recommended. After they expire, they won’t be able to absorb and hold moisture and urine as well as they could when recently manufactured. When not stored properly, keeping them in a hot cupboard or next to a window, for example, can make the nappies change colour or develop marks inside or outside the nappy. As a result, a nappy that’s been kept for more than two years and looks yellow inside or has faded designs on the outside can still be used if you’re in a bind, but it would be better to use a fresh one. Pampers run their own customer rewards program because they know parents and caregivers will have to buy mountains of nappies over their baby’s lives. Just like any other customer rewards program, points can be redeemed for gifts and other products. Pampers Rewards don’t ask that you buy their products from partners, which means you can earn points from the unique on-pack code you see when you buy any pack of Pampers nappies and wipes, with extra points on offer if you complete other activities on the Pampers website. To help save money on the constant cost of buying nappies, there are many websites offering discount coupons and free samples. You may even be entitled to a small supply of nappies to take home from the hospital after giving birth. Pampers Club social groups differ from Pampers Rewards, in that they are not affiliated with Pampers themselves but do offer rewards for being a part of them, such as discount coupons and free gifts. Many of these groups can be found on social media sites and are usually free to join. However, free samples and Pampers clubs will probably not be able to keep you in constant supply of all the nappies you need. But all is not lost. Many big merchants are selling nappies in bulk, especially online, where huge savings can be found. Amazon offers great deals on its range of Pampers nappies and wipes in the various sizes, including Pampers Splashers Disposable Swim Pants. These are generally only for sale in the US, but are known to be sold out on popular styles and sizes. The Toys R Us online store is another big retailer selling Pampers nappies and wipes. While there is no best time to buy cheap nappies – as long as babies are born, a need will be there! – you can save money in the long run by stockpiling nappies for future use when you do see a good deal. Make sure you bookmark the special ‘Pampers’ page on HotUKDeals to keep up to date about the best deals on Pampers nappies and wipes.